Connect the awesome WordPress form system, Gravity Forms, with your Pardot account to create and update prospect details using Gravity Forms. Pardot to Gravity Forms Connector seamlessly hooks into Gravity Forms providing a simple experience. The setup process is too easy! All you need to do is go to the settings page and enter in your Pardot email, password and user API key as shown below (the API key can be retrieved from your user settings page in Pardot). You may be asking why do I need this plugin? That’s a good question because there are alternative methods available. This includes creating the forms in Pardot and just putting the supplied Pardot iframes onto your website. The downside of this is that it uses iframes so it makes it difficult to stylise the form and sometimes it can be a little clunky and you don’t get the power that a form system like Gravity Forms has like other 3rd party plugins and conditional fields etc. The other option is you can use form handlers in Pardot to manually map your Gravity Form fields to Pardot. But this can be difficult for some to setup and it frankly takes a lot of time. You need to manually create a form handler for each form and the setup process is prone to errors due to the field mapping process. Also using form handlers you need to set the completion action of your Gravity Form to a redirect URL and pass data to Pardot which will then redirect back to your site. But what if you want to display a custom message instead? What if you want to do some cool things with query strings etc. etc. Because this plugin uses the Pardot API it bypasses this messy iframe and form handling experience and replaces it with a far more natural and easy to use Gravity Form-like experience so you don’t even need to go to Pardot to do anything except to get your API key initially when setting up the plugin! This plugin is really simple but really powerful. The above screenshot shows the authentication setup of the plugin where you just need to enter in your normal Pardot email and password as well as your API key mentioned earlier. This page can be accessed by going to the normal Gravity Forms settings page and going to the ‘Pardot Connector’ tab. After you have authenticated successfully you can now map your Gravity Form fields to standard and custom Pardot prospect fields for each form (so yes you can have unique mappings for each form). To access this mapping page you just need to go to your individual Gravity Form settings page and go to ‘Pardot Connector’ tab. As well as being able to map standard and custom Pardot fields you can also do other Pardot actions like adding to the score of the prospect, adding the prospect to the list, adding the prospect to a campaign or assigning the prospect to a Pardot user. With these actions at your fingertips you will spend less time in Pardot mucking around with automations or other completion actions. If you need some other functionality or custom development work please contact us and we will see how we can help you. Does this plugin support progressive profiling like Pardot Forms do? No, but…we have developed a plugin called Progressive Profiling for Gravity Forms which replicates the progressive profiling of Pardot in Gravity Forms. Progressive Profiling for Gravity Forms has been designed to work with this plugin specifically in mind. Not only this, but Progressive Profiling for Gravity Forms has some additional progressive profiling options that Pardot doesn’t even have. So why not buy both plugins and live in a Gravity Forms Pardot nirvana! In version 1.5, Pardot to Gravity Forms Connector will now associate website visitors to newly created prospects created by the plugin. So if a visitor clicks around your site for the first time visiting many pages and then they complete a form these page views will show up in their prospect record. This is achieved using cookies, so just like other form methods available like form handlers and the iframe embed forms supplied by Pardot, tracking will only take place if the visitor has cookies enabled. Now in version 2.1 you can add in an opt-in condition which can contain one or many criteria before adding someone to Pardot. New Custom Field, List and Campaign Manager! 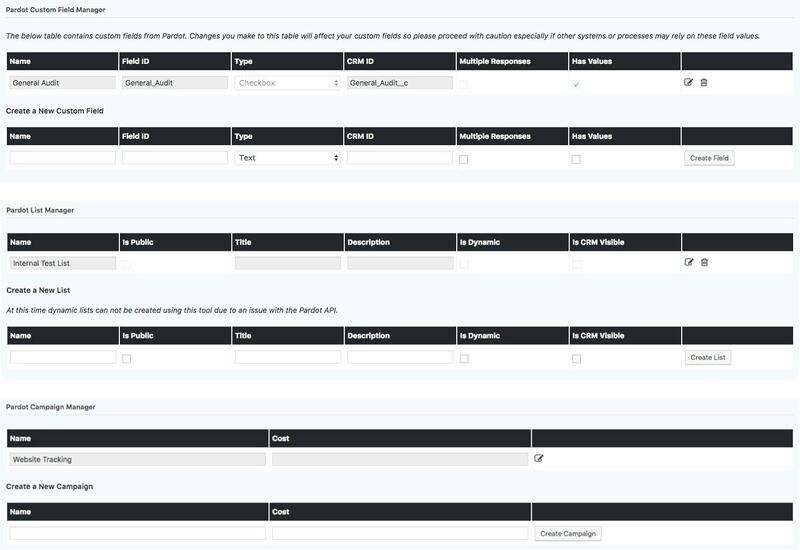 Now in version 3.0 you can create, edit and delete Pardot custom fields, lists and campaigns from within WordPress! Simply go to the plugin settings page and make your changes – it saves having to go to Pardot to do simple procedures. Awesome value at a low price! At just $15USD the Pardot to Gravity Forms Connector provides a powerful WordPress Plugin that can help you link Pardot and Gravity Forms together! Pardot to Gravity Forms Connector includes free updates for 1 year and the plugin can be renewed for continual updates if necessary. Gravity Forms, Pardot and WordPress are separate products and not owned or managed by Northern Beaches Websites. Please read the terms and conditions for Pardot to Gravity Forms Connector here.